Institutional design can also drive the direction and robustness of decentralization policies. Decentralization meets institutional roadblocks that thwart its implementation. The institutional design can point to the rules and procedures that characterize the nature of the decentralization regime, though it can also speak to the norms and principles that are at play in the system overall. Generally, when the rules and procedures in place are coherent, and adequately mirror the goals of decentralization, decentralization is successful. When there is an incoherent policy framework, however, then decentralization efforts tend to fail. 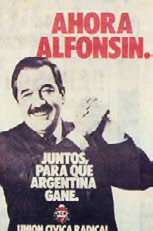 Election propaganda for Former President of Argentina Raul Alfonsin, who promoted fiscal decentralization. Although the revenue sharing scheme gave districts some amount of fiscal autonomy, the central government still had the right to collect income and corporate taxes.29 Finally, the electoral design in Indonesia does not provide for direct elections of mayors and governors, who are instead appointed by members of the local parliament.30 In a system based on proportional representation without party membership, citizens may not know who represents them in parliament. Because of this, politicians have less incentive to be accountable. Finally, it must be noted that since political parties in Pakistan are less likely to adopt policy platforms, it becomes more likely that voters will judge politicians based on the types of programmatic benefits they can provide to their constituents, creating Election propaganda for Former President of Argentina Raul Alfonsin, who promoted fiscal decentralization. a huge incumbency advantage. In both of these case studies it is apparent that the institutional design upon which decentralization was implemented mattered. In the Indonesian case study the ambiguous wording of the law — which gives the central government the right to assume "all other authorities" — allowed the central government to devolve more control to local governments.34 The district level decentralization scheme can also be called into question, given the unpreparedness of the districts to handle the tasks once administrative decentralization occurred. Rather than increasing administrative efficiency and improving on the provision of public goods, districts were left unprepared for the responsibilities of decentralization and could not effectively administer the provision of public goods. Furthermore, the fact that income and corporate taxes were kept by the federal government provided a disincentive for districts to compete with one another in order to attract business and income.35 This had negative consequences, since competition between local governments typically leads to better policy ideas and implementation that would only work in favor of local populations.36 Instead, local politicians were left to seek revenue from natural resources, which led to less accountability of funds and more avenues for corruption. This was evidenced by the fact that although local governments raised more revenue in Indonesia, these funds were not necessarily used for better public service.37 If decentralization is supposed to bring the government closer to the people, the indirect election of district politicians makes it less likely that this outcome will emerge. The results of decentralization in Pakistan show a similar trend. The form of "partial decentralization" administered at the local level still allowed the provincial authorities the ability to wield power over district affairs, without giving the district-level decision makers authority over management of vital district functions.38 Furthermore, indirect election of district nazims made the decision making process less transparent at the local level. Rather than trying to curry the votes of the district as a whole, the district nazim is more inclined to seek the support of union votes, which represent a much smaller swath of the population. This makes it more likely that politicians will seek to provide a more targeted selection of programmatic goods rather than providing goods for the general public. Indirect elections at the district level, and political parties which lack policy platforms, make it more likely that politicians will adopt clientalistic practices. The issueless nature of politics in this example gives voters less of an opportunity to hold politicians accountable. Decentralization does not always live up to the expectations of its advocates. As we have seen, politicians support decentralization if it suits their interests. However, these same initiators of decentralization can also work to derail the deepening of decentralization if it does not work in their political interest. In theory, decentralization should be a win-win proposition for all involved actors; however, in order for decentralization to succeed, the right mixture of political incentives, sequencing, and political design must be at work to facilitate this reality. Nnenna Ibeanusi is nearing completion of her Bachelor's in Political Science with a specialty in International Relations and Comparative Politics at the University of California, Berkeley. She has worked as a contributing writer for the Berkeley Political Review since her sophomore year and has written about such topics as the emerging dominance of the AK Party in Turkish politics, the splits within the ANC in South Africa, and the effects of Mexican President Felipe Calderon's war on drug cartels in Mexico. Nnenna is also interested in issues of global governance, the role of international institutions and regimes, as well as issues of democracy and good governance. Tulia Faletti, “A Sequential Theory of Decentralization: Latin American Cases in Comparative Perspective,” American Political Science Review, 99(3), (August 2005) 327-346; Alison Post, The Effects of Decentralization,University of California, Berkeley, 20 Barrows, Berkeley, CA. (12 Oct. 2010), from lecture. Alison Post, The Effects of Decentralization, (19 Oct. 2010), from lecture. Kent Eaton, “Political Obstacles to Decentralization: Evidence from Argentina and the Philippines,” Development and Change, 32(1), (January 2001), 101-127. Kent Eaton, “Political Obstacles to Decentralization: Evidence from Argentina and the Philippines”; Alison Post, The Effects of Decentralization, (19 Oct. 2010), from lecture. Syariff Hidayat and Hans Antlov, “Decentralization and RegionalAutonomy in Indonesia,” from Philip Oxhorn, Joseph S. Tulchin, and Andrew D. Selee, ed. Decentralization, Democratic Governance, and Civil Society in Comparative Perspective, (Washington D.C.: Woodrow Wilson Center Press, 2004), 266-294. Philip Keefer, Ambar Narayan, and Tara Vishwanath, “Decentralization in Pakistan: Are Local Governments Likely to Be More Accountable Than Central Government?” from Pranad Bardham and Dilip Mukherjee, eds., Decentralization and Local Governance in Developing Countries, (Cambridge: MIT Press, 2006), 285-304. Syariff Hidayat and Hans Antlov, “Decentralization and Regional Autonomy in Indonesia,” 278. G. Montinola, Y.Y. Qian, and B.R. Weingast, “Federalism, Chinese Style—The Political Basis for Economic Success in China” World Politics, 48 (October1995), 1-30. Philip Keefer, Ambar Narayan, and Tara Vishwanath, “Decentralization in Pakistan: Are Local Governments Likely to Be More Accountable Than Central Government?” 290.